Key Master Mini Arcade Machine is a one player prize redemption arcade machine from Sega. Players use buttons to control a "key" mechanism, and must aim to slot the key into the keyhole of their desired prize. If players are successful, the key will unlock the prize and it will be pulled from the rail and dropped into the prize chute. 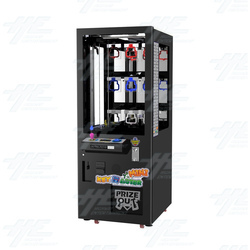 The machine allows for 3 prize levels (minor, medium and major) and has operator adjustable difficulty settings. The Key Master Mini Arcade Machine stands out in the middle of any floor and it’s small footprint allows a wide variety of locations to include this in their range of machines. Key Master Mini Arcade Machine is a one player prize redemption arcade machine from Sega. Players use buttons to control a "key" mechanism, and must aim to slot the key into the keyhole of their desired prize. If players are successful, the key will unlock the prize and it will be pulled from the rail and dropped into the prize chute. The machine allows for 3 prize levels (minor, medium and major) and has operator adjustable difficulty settings. The Key Master Mini Arcade Machine stands out in the middle of any floor and it’s small footprint allows a wide variety of locations to include this in their range of machines.